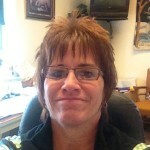 Kim Sutter is a graduate of Celina High School and has worked for Celina City Schools Celina for 25 years. She has served as the Transportation Supervisor since 1994. The district covers 146 square miles of Mercer County, with a student enrollment of approximately 2700. The department is double routed with 18 regular and one special needs route. Mrs. Sutter has been a member of OAPT since 1994 and she has served as the Secretary-Treasurer since 2007. In 2014 the positions were split and she remained as Treasurer for another two-year term. In addition, she is a member of the National Association for Pupil Transportation, and the Ohio Association of School Business Officials. Mrs. Sutter and her husband Alan have owned NotAl’s Lakeview Carryout/Liquor Store since 2010. With her brother and sister, she is also a partner/owner of the Shingle Shack Restaurant on Grand Lake St Marys, which has been a family-owned business since 1981. A resident of Celina, Mrs. Sutter has three children, Brandi, Rob and Derek, and a beautiful granddaughter, Brooklyn.